Dappled Dots PinPoint Embossing Folder embosses pinpoints in a dot pattern. A quality embossing folder that creates a deep and crisp emboss in card stock, paper, vellum, foil and many other surfaces to enliven any craft project. Includes 1 folder. Size: 5.75 x 7.5 inches. Hero Arts stencils are made of thick frosted mylar with premium laser-cut images. Use a paintbrush, ink pad, dauber, or spray to leave a stylish impression. The Stencil measures 6" x 6". Love themed Impression Obsession die featuring a background of hearts. US-made steel die compatible with most table-top die cutting machines. This is a single die measuring approximately 3-3/4 x 5 inches. 4" x 6" set of Christian clear stamps featuring "amen", fish, and arrow background patterns. This 5" x 7" Embossing Folder is called Bubble Explosion. Compatible with most leading brand die cutting and embossing machines. Personally designed by Leonie Pujol, this beautiful collection is perfect for all your crafting creations. Featuring 5"x7" embossing folders, metal dies and stamp sets. With this papercrafting collection so you'll have everything you need to create a beautiful cards. Craft art mask from Carabelle Studio featuring a Small Checkerboard background pattern. Creative Expressions Weaving Collection Intermediate. An elegant collection of high quality steel dies designed to co-ordinate with each other. These dies cut slits in your cardstock for weaving. For easier weaving cut one end of the cardstock slits with scissors so the strips are only attached on one end. Cut another cardstock in coordinating colour and clip the strips off with scissors for your weaving strips. Designed by Sue Wilson. Includes 1 craft die. Size: 4.3 x 5.3 inches. A6 size mask from Carabelle Studio featuring a background pattern of Bubbles. 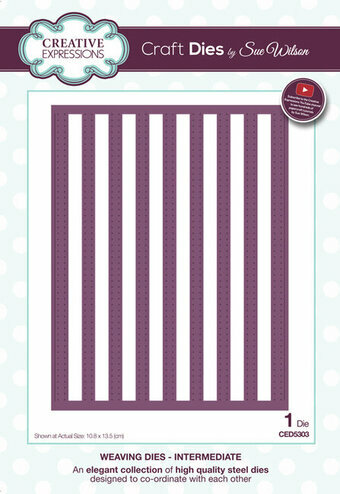 Enjoy the craft of cardmaking with an accessory that simplifies the process! 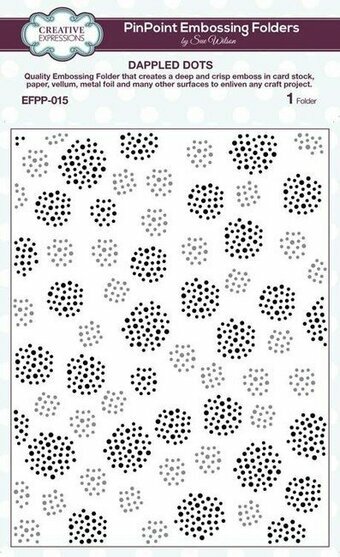 Our burst pattern embossing folder is characterized by a versatile design of bursting droplets that can be used for almost any papercrafting occasion - from thank you cards to birthday cards. Burst background embossing folder. Vertical or horizontal orientation. Works best with heavyweight cardstock. Fits most embossing machines. Folder measures 4.25 x 5.75 inches. 1 embossing folder per package. 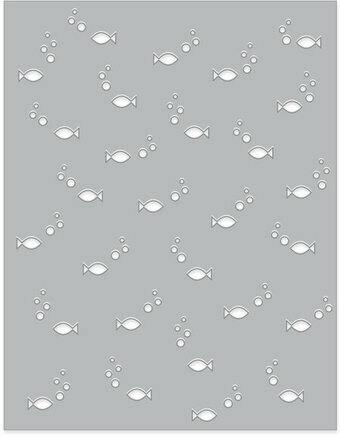 Embossing folder featuring a background pattern of dots. Designed by Sue Wilson these cutting dies are an elegant collection of high quality steel designed to co-ordinate with each other. Contains 4 dies. Size: Smallest die: 0.90" x 2.95", Largest die: 4.10" x 6.10". Creative Expressions Mini Stencil - Bubble Burst. Made from durable plastic, these masks can be used in a wide range of techniques. Use with Dye Ink Pads, Texture Paste, Paint, Cosmic Shimmer, Gilding Wax, Versamark with Embossing Powders and Mica Powders, Gilding Flakes, Micro Beads, Mica Flakes, Gilding Polish, Shimmer Paint and much more. 1 Mask. Size: 2.90" x 4.10". Creative Expressions Mini Stencil - Splattered. Made from durable plastic, these masks can be used in a wide range of techniques. Use with Dye Ink Pads, Texture Paste, Paint, Cosmic Shimmer, Gilding Wax, Versamark with Embossing Powders and Mica Powders, Gilding Flakes, Micro Beads, Mica Flakes, Gilding Polish, Shimmer Paint and much more. 1 Mask. Size: 2.90" x 4.10". Christmas themed Memory Box stencil featuring a background of holly leaves. 4.3 x 5.7 inches. 10.9 x 14.5 centimeters. PinPoint Embossing Folders by Sue Wilson - Checkboard. A4 size. ** These folders will not fit in a Cuttlebug or Big Shot machine or any small platform size machine. Please measure your embossing machine platforms before ordering. Size: 7 7/8" wide x 11 11/16" long. PinPoint Embossing Folders feature a multi-level emboss to create a beautiful and unique faux-pierced effect. Each pattern has a distinctly different look on each side to create extra flexibility. Larger size means no need to extend pattern. Memory Box stencil featuring a background of dots. 4 x 5.6 inches. 10.2 x 14.3 centimeters. Falling rain makes a wonderful background for so many Spring images. Stencil measures 4 1/4" x 5 1/2". Embossing Folder Sweet Cherries. Size: 7.50" x 5.75". Quality Embossing Folder that creates a deep and crisp emboss in card stock, paper, vellum, metal foil and many other surfaces to enliven any craft project. 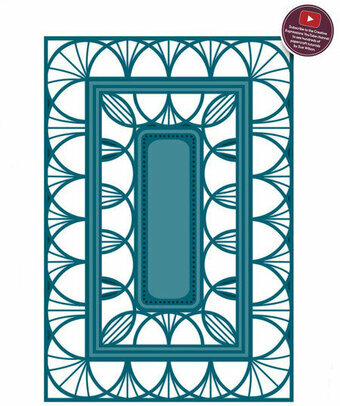 These larger size folders can be used with any embossing machine that takes A4 sizes. Valentine themed Memory Box craft die featuring many small hearts. Great for backgrounds!